First edition. Octavo. 251 pp; 48 b/w illustrations. Publisher's burgundy cloth with dustjacket. VG/VG, small erasure spot on front flyleaf, else a clean, unmarked copy; price-clipped jacket lightly chipped at top & bottom of spine, short edge tear, light soil on back panel. 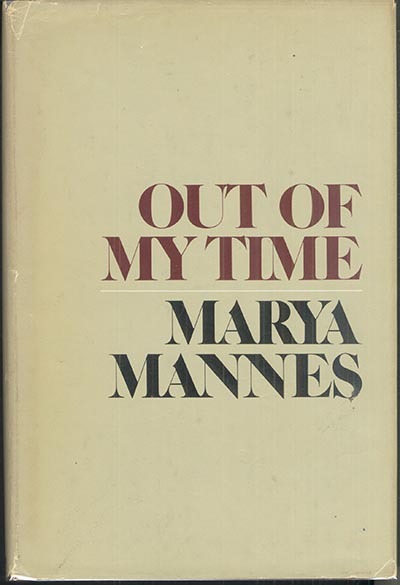 Autobiography of Marya Mannes (1904-1990) American writer and critic, known for her insightful observations of American life. Marya describes her childhood in an uncommon family - her parents, Clara Damrosch & David Mannes founded the Mannes College of Music, and her musician brother co-invented the Kodachrome process - and her uncommon education.